Pictured above: MBARI researchers released biodegradable dye from the research vessel Paragon (left) while collaborators from the US Coast Guard and other organizations watched from a second boat nearby. An unmanned aerial vehicle (UAV) was able to capture the extent of the dye dispersion. Many critical ocean processes occur, or are exposed at, the interface of the air and the ocean surface. Aerial sensing platforms can provide safe, inexpensive methods to observe these phenomena in great detail, with regularity, and on short notice. To advance access to this area, without adding more ships to the MBARI fleet, a team of scientists and engineers is perfecting how to use the rapidly developing technology of unmanned aerial vehicles (UAVs). UAVs will enable a wide variety of repeatable and low-cost science applications including repeatable surveys of animal counts and locations, thermal and color ocean-front tracking, harmful algal bloom detection and monitoring, kelp forest health, predation behavior, marine debris, distressed animal detection, and lost-vehicle recovery. This technology will also document MBARI at-sea operations for educational and outreach purposes. 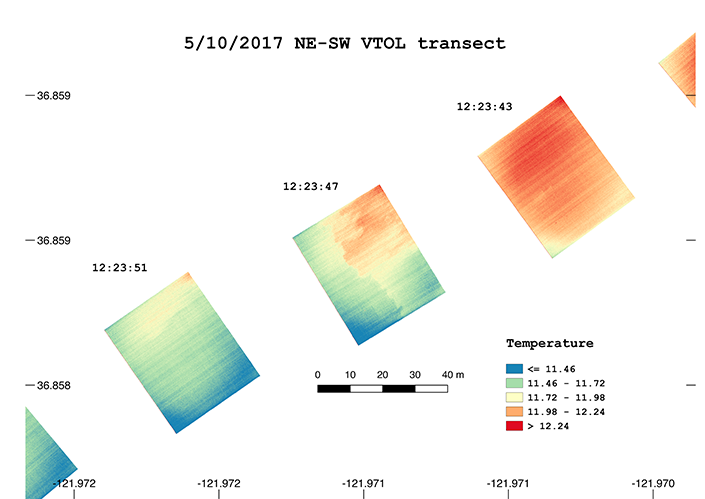 Thermal forward-looking infrared camera sea-surface-temperature images acquired by Flightwave Edge UAV from 60 meters (almost 200 feet) altitude during a northeast-to-southwest transect on May 10, 2017. Red and orange represent warm temperatures, green and blue are cooler. A thermal front is clearly visible in the middle frame at 12:23:47 UTC. 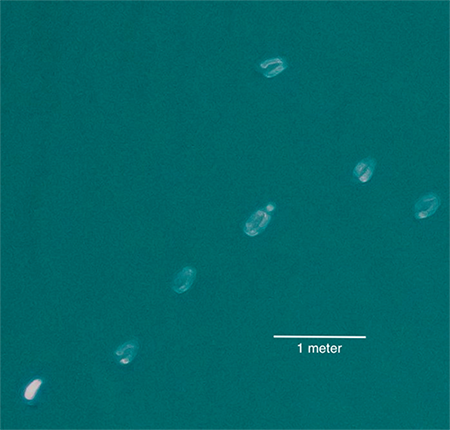 Jellies, likely *Aurelia aurita*, photographed from 60 meters altitude by Flightwave Edge UAV in spring 2017. Camera resolution is 16 megapixels; the project team proposes to integrate a 25 megapixel camera with the Edge in 2019. 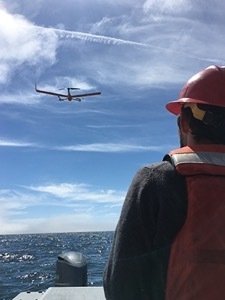 MBARI’s UAV project team of engineers, scientists, operators, and communications experts, along with collaborators from the Monterey Bay Aquarium, academic organizations, and government agencies will investigate several of these uses in 2019. The team will also develop best-practices, safety guidelines, and the legal permitting needed to operate these new technologies responsibly from the shore and MBARI ships. 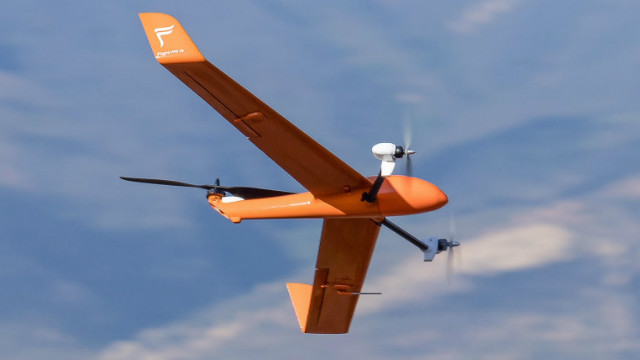 To accommodate these preliminary trials, the team has procured a vertical take-off and landing UAV, with an interchangeable and customizable nose-cone to carry a number of different sensor payloads. These types of vehicles can view and collect data over an approximate flight time of 90 minutes at speeds up to 100 kilometers per hour, and then land on the back of a ship or return to shore. The UAV project team aims to show how these new low-cost aerial technologies will reveal processes at the air-sea interface in ways not previously possible. Trent Lukaczyk of Flightwave Aerospace Systems landing the Flightwave Edge vertical takeoff and landing aircraft on the aft engine hatch of R/V Paragon during an MBARI science experiment. Using virtual reality for science and education about the deep sea.